Garnet, a deep-red gemstone whose shade is reminiscent of the color of pomegranate seeds, is January’s birthstone. The origin of the name “garnet” – “dark red” – can be traced to the Latin phrase “punica granatum,” or “pomegranate,” as the plant’s red seeds are similar in color to the garnet’s shade of red. 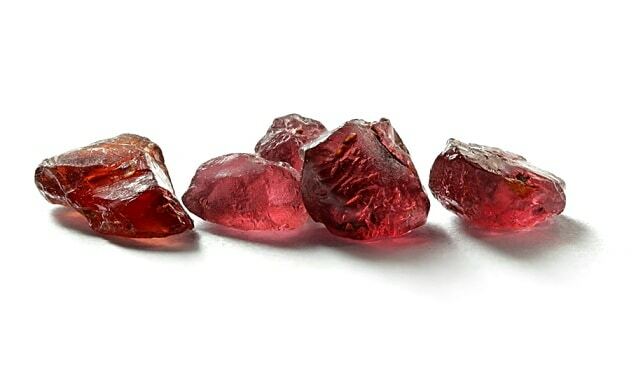 Almandine garnets got their name from Alabanda, a town in Asia Minor which was the center of gem polishing at the time of Roman senator Pliny the Younger, in the second century AD. The garnet is often thought to be one of the Hoshen stones – the gems adorning the ceremonial breastplate worn by the high priest of the ancient Israelites. As garnets appear mainly in red or green, some believe they may be the Hoshen stone referred to in descriptions of malachite or emerald. Garnet symbolizes perseverance and strength and is known as a “commitment stone,” which reinforces tenacity and commitment. The ancient Egyptians hailed garnets as a symbol of life. The stone was used for various medicinal purposes in the Middle Ages. In India and Persia it was worn as an amulet by warriors to ward off the plague, pestilence and being struck by lightning. Some believed that the image of a lion carved out of garnet could protect one’s health and keep them safe while traveling. The garnet’s reddish color also inspired the belief that it was good for the circulation and could help in case of hemorrhage. 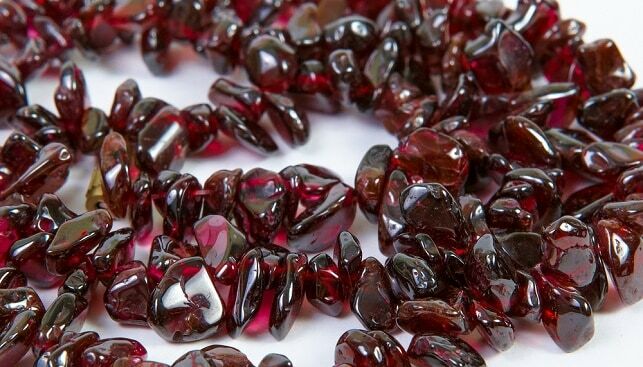 In crystal therapy, garnets are used to fight poisoning, depression, hypothyroidism, back and neck pains. The gemstone is also believed to enhance emotional intelligence and rid one of sexual inhibitions. In ancient Egypt, garnets were used in statues of Isis, goddess of earth fertility, as a symbol of her power. Third century BC Greeks used to set wide garnets in massive gold rings. Romans carved images out of the stone. In the 18th century garnets were set in hoop earrings, and the stone was a favorite for brooches and bracelets in Victorian England. Various Asian tribes used garnets as bullets, believing that due to its color the red stone would inflict a more severe injury than that caused by lead bullets. Quality garnets are as bright as a flame: Legend has it that Noah used garnets to light the ark. Garnets are mined in South Africa, Australia, Brazil, Sri Lanka, North America, the Czech Republic, Madagascar and India. Joan of Arc, Robert Burns, Jim Carrey, Elvis Presley, Wolfgang Amadeus Mozart.